« Homos: We have gone a long way! Let me say that life has been rather hectic in the past three months, therefore I have not had enough time to write more econ-related posts, which was the original idea behind the blog. Now that work life is a bit easier on me, I will start lecturing and pontificating about something most of you are not even interested in. When I was working at a check out in a super market in Italy, I realised that there is a lot you can learn about a person’s life looking at how they spend their money on a daily basis. A single man going on a dinner date would buy wine, deodorant, a lot of food you cannot cook one single dish with and condoms. A working mother (with toddler) would rush through the supermarket on her way home and grab a disparate set of things such as baby food, comfort food, diapers, fruits, vegetable, staples, bottle of wine. Taxes on employment 10.5 billion EGP (p.30) (on average 130 EGP p. capita p. year, but of course most of the people who pay employment taxes are those employed in the public sector and the few private sector companies that abide by labour laws). Taxes on beer and alcohol: 330 million EGP (p.59). This is higher than total sales tax (!) because places that sell alcohol are regulated as opposed to the rest of the economy. Subsidies to peasants committed 405 million EGP, spent 144.5 million (p.23). Maybe Egyptian peasants do not need subsidies – Meanwhile Egypt is reported to be the world’s largest importer of wheat. In 2010, the oil minister stated that Egypt imports 40% of its food, and 60% of its wheat (source: here). Support to low-income housing 1 billion EGP committed and spent (p.23). (I wish I had the time to follow-up and see HOW these 1 billion EGP were spent). Health insurance for the unemployed 14.4 million EGP (p24). With at least 2.3 million unemployed according to government sources, it’s an average expenditure of 7 EGP per person. Taxes revenues from sales are fairly low. This is partly because a lot of trade takes place in the informal economy. However, taxing sales (VAT style) means that does who consume more pay more – The same applies to tax revenues from employment which are much higher than tax revenues on industrial and commercial activities. At the same time, if you happen to be working in the formal economy or public sector, you will be paying a disproportionate amount of taxes on your income. Expenditures seem to be geared towards subsidising consumption and the real estate market rather than, say, providing health insurance for the unemployed. Also electricity is subsidized – which is great, except these subsidies end up benefitting the ones that are better off . For instance, let us look at petrol subsidies that absorb over 4.4 billion USD every year (incidentally you may wish to compare this to Obama’s offer of debt relief totaling roughly $1 billion “over a few years“). Let us imagine that on a given day a well-off expatriate (whom we shall call Mr Economic Revolution) fills his car with 30 litres of petrol. 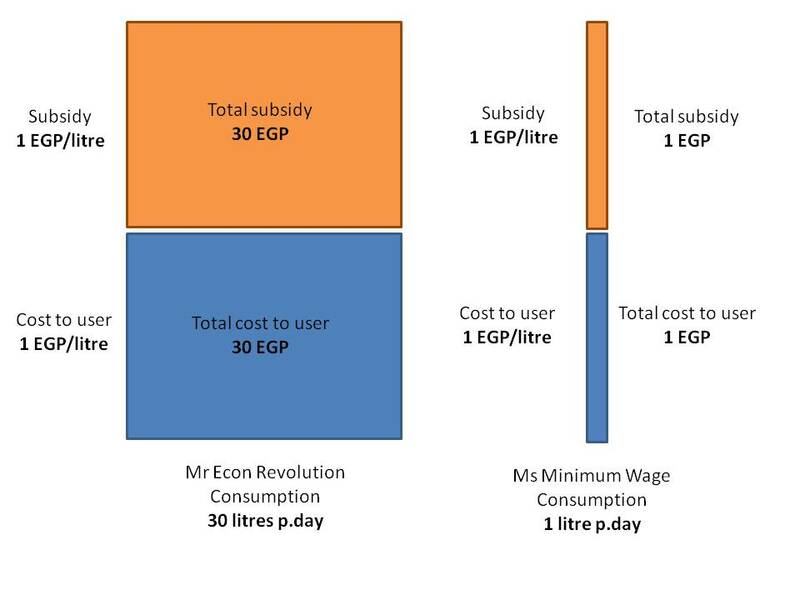 Now the price of each litre is 2 EGP half of which is subsidies (I am using a fictitious amount just to make the explanation simpler). Therefore the Egyptian state just paid 30 EGP towards the consumption of Mr Economic Revolution who happens to be a wealthy Italian expatriate working in Egypt. Ms Minimum Wage is an Egyptian mother who works as a public servant. She does not own a car so she uses public transportation to get around town. Because she shares the cost of a ride with many passengers her daily consumption of petrol is lower, say 1 litre per day (again, fictitious). Everyday, the Egyptian state spends 1 EGP ensuring that Ms Minimum Wage can get to work. So basically, the morale of this blog post is that even a cursory look at the Egyptian budget reveals a regressive social policy (i.e. a policy that takes more in terms of percentage of income from the poor than the rich, check here). The expenditure pattern mirrors the one of the ficticious single man going on a date: i.e. one of instant gratification. Of course the issue of subsidies and social policy is way too complex to be tackled here. However, one may only wish that the way public money is spent in Egypt is geared towards investment in public services (i.e. treating citizens as a resource) rather than towards subsidising consumption (i.e. treating citizens as consumers). Of course I am not arguing for a blanket elimination of subsidies neo-liberal style, as some of them do play an important role in creating a safety net (especially food subsidies). What I am arguing for is a bolder vision of economic and social policy (an economic revolution, perhaps?). One way could be to eliminate some of the subsidies and redirect the savings towards better wages for public servants and conditional cash transfer programmes for the poor. I am including a link to a World Bank’s review of conditional cash transfer programmes to prove that I am not talking about sci-fi but mainstream public policy discourse spurred by socialist governments and embraced by the liberals as well.